Yes. I said lobster… mushrooms. Lobster mushrooms are actually 2 kinds of fungus that live in parasitic relationship with one another. 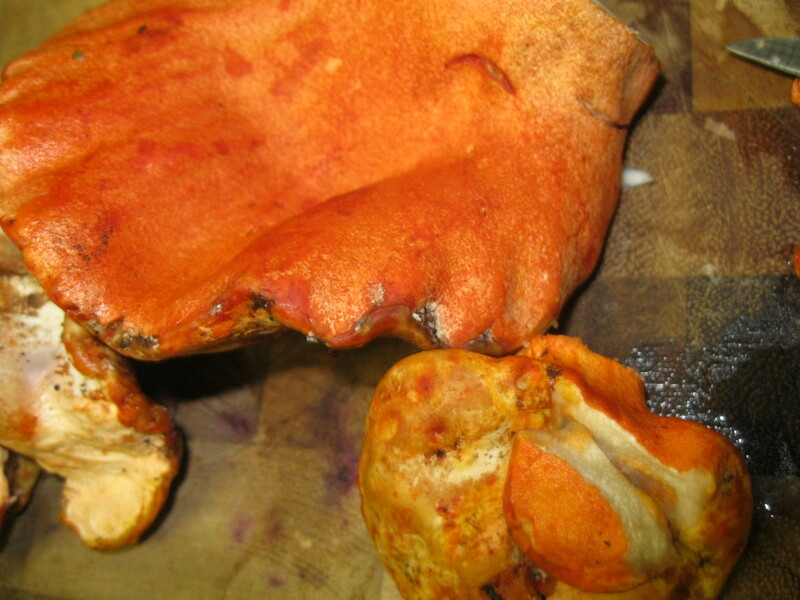 The fungus Hypomyces lactiflorum gives the characteristic red color to the outside of the white fleshed Lactarius piperatus. L. piperatus feeds the parasite which will eventually render the host unrecognizable. 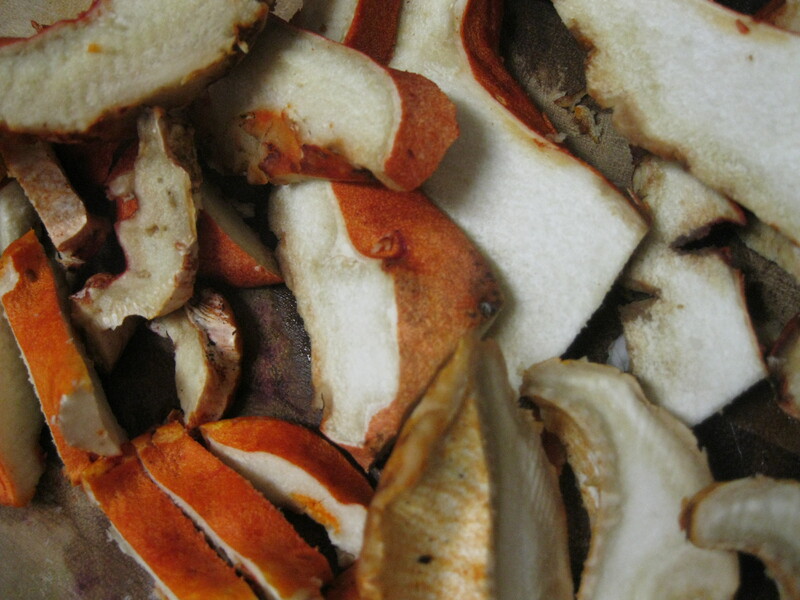 Above is the sliced uncooked mushroom which does bear a striking resemblance to chopped cooked Maine lobster. 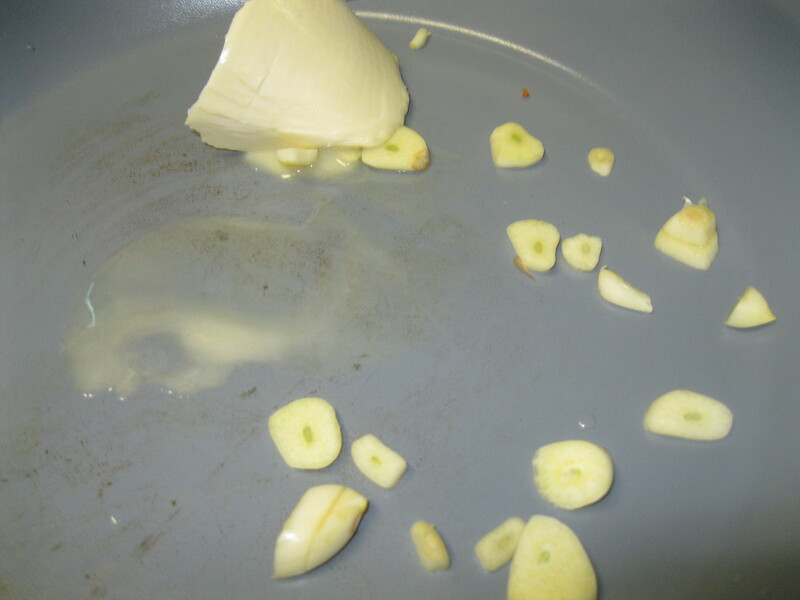 I decided to do a more traditional preparation of these mushrooms by sauteeing in Earth Balance vegan butter and garlic. This is more butter than I’ve used in years for anything so I was excited for something decadent. As with most foraged foods, these mushrooms should be cleaned carefully and inspected for insects and dirt. Also some people can have a mild adverse reaction to these mushrooms the first time they eat them so if you’re unaccustomed to these mushrooms, sample sparingly. While cooking, these mushrooms have a delicate seafood smell and that with garlic and butter was very confusing for someone who hasn’t had lobster in a few years. I served this up with steamed asparagus and some chipotle lime quinoa. The flavor of this mushroom is light, fruity and with a mineral flavor that is not unlike real lobster. The texture is a little tougher than appropriately cooked seafood, not quite rubbery but more crumbly. This isn’t an ersatz meat but really a food with uniquely desirable qualities. I’m hoping that the next time I get my hands on a few of these I’ll be able to make a lobster mushroom bisque. I hope you get to try it! 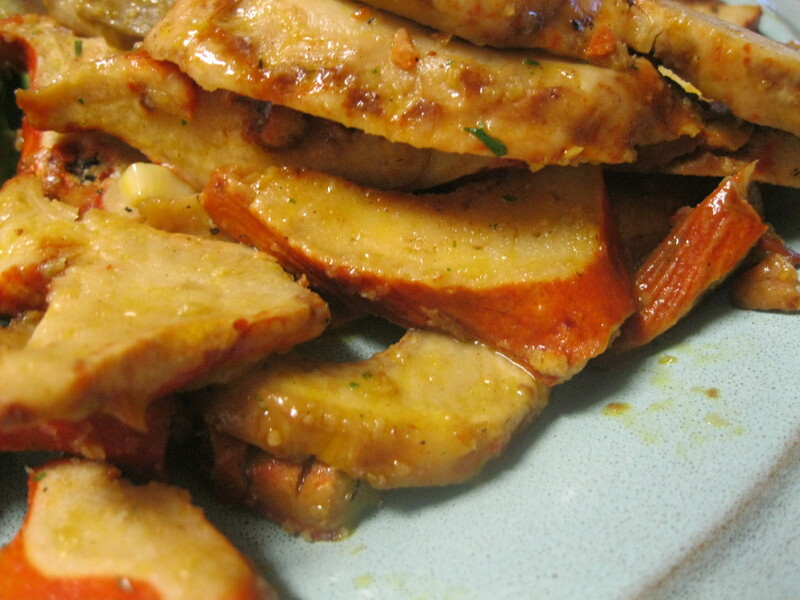 Despite the words parasite and fungus, I really want some lobster mushrooms right now. Ack! Must get my hands on some of these soon. I love any and all type of fungi and now I have a new one to try. Thanks for sharing this. It looks yummy! Christie, I’ve never even heard of lobster mushrooms. I totally want that lobster mushroom bisque now! 🙂 Wait until I get my hands on some hen of the woods mushrooms… nature does the COOLEST things. It’s probably why I grew up to become a biochemist. Exactly! Which is why you rule! Totally forgot to comment on this — MUST. TRY. LOBSTER. MUSHROOMS. A couple of years ago, I made a great, on-the-fly lobster bisque that I would LOVE to make vegan. I’m on the prowl for these guys now. Farmers market, here I come! Christie/Brent. this. is. awesome. i cannot tell you how much i want to eat this. Mushroom is one of my magical/orgasmic food words. Lobster/sea food USED to be one of my magical food words. i want to eat all of this. There are a few other mushrooms I’d like to showcase on TV. Nature just does the coolest things. Wow… that looks very strange but my curiosity has been piqued! I learn so much from your blog.